After the highlights of Day 3, you will find all my individual player assessments. But first, here’s a little snippet of the Team Delvecchio practice. Joe Hicketts has succeeded and defied the odds at every level of hockey that he’s played at. His intentions are clear this year: to play a game at the NHL level. The small-in-stature but tough as nails defenseman has determination and it shows both on and off the ice. 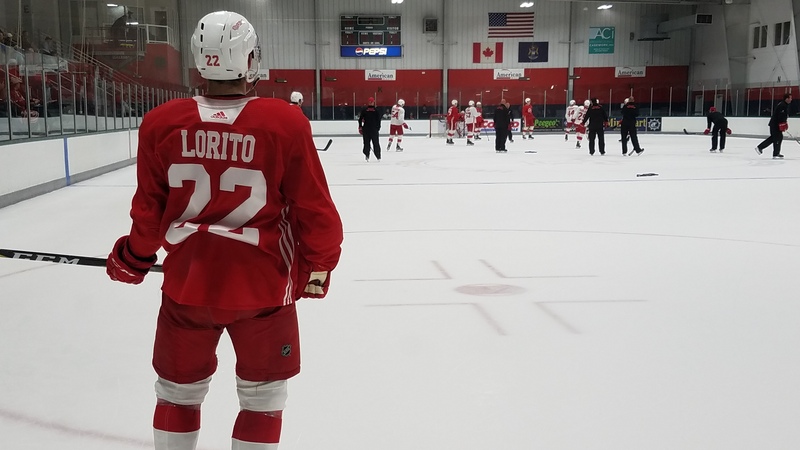 He recently won the Calder Cup with the Grand Rapids Griffins this past June, and this experience has propelled him into this training camp. He also talked about his expectations for this season. Justin Abdelkader spoke about goalie Petr Mrazek. Anthony Mantha noted that he learned the importance of consistency last season. He knows that to be an effective NHL player, you need to perform on a consistent basis. “That’s what you need to be a good professional athlete,” he said. He also hopes (as do all the players) that Andreas Athanasiou signs soon and rejoins the team. Here are my final evaluations of some of the attending players. Ben Street had an amazing season with the Grand Rapids Griffins last year, and it led to a great camp for him. In the line sprints, he beat Dylan Larkin in speed multiple times. It’s hard to tell what percentage the players are giving during the drills, but his speed and stamina impressive either way. 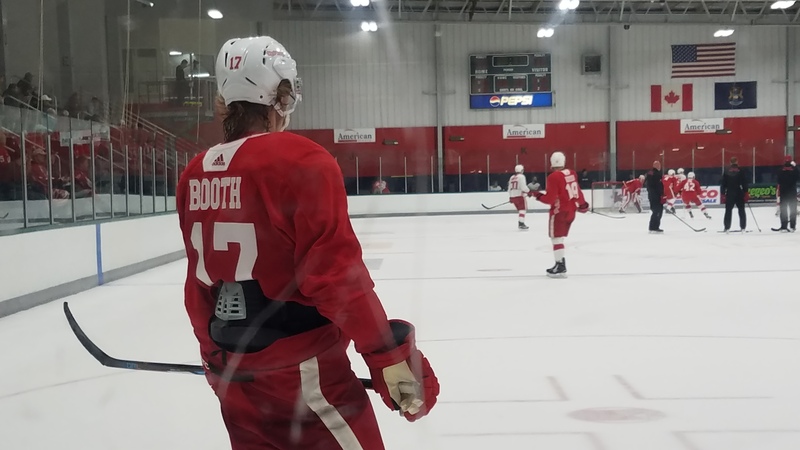 David Booth was one of two NHL veteran forwards in attendance at the camp. When compared to P.A. Parenteau, he was a tad slower, but overall he skated well and seemed to really enjoy the opportunity to try out, following a journey to the KHL. He won’t make the Red Wings roster, but the pre-season may allow him to impress another team enough to earn one more NHL contract. 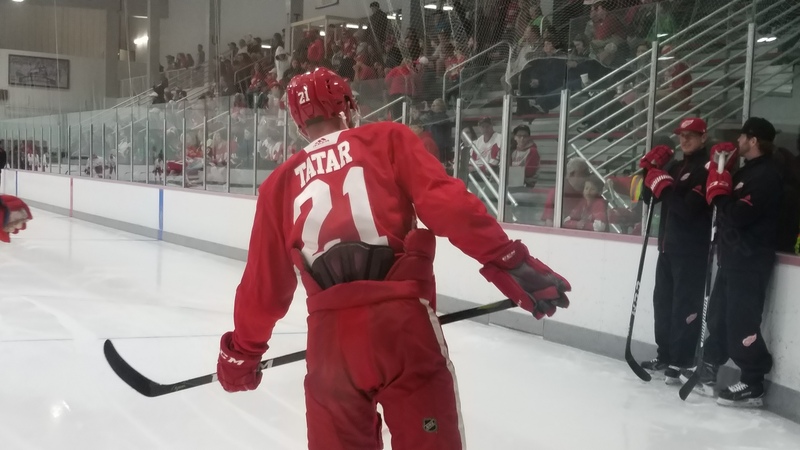 Tomas Tatar was on fire all weekend long, scoring in a practice scrimmage and adding the shootout winner a few days ago, and scoring the game-winning goal during the Red and White game this afternoon. He seems re-energized and poised to have a really great season. His new contract may be his motivation. Matt Lorito is just a great hockey player in many ways. He’s fast, smart, and has a wicked one-timer. His shot is fast and accurate. The only downside is just his size, but that didn’t appear to hinder him last season in GR. Look for him to add to last season’s point total. Dominic Turgeon, the tall center with good size, still has not made a good enough impression. He had a dismal 6 goal, 18 point campaign (71) in the AHL after dominating in his fourth full season of junior. His point production can only get better at this point. In his fourth post-draft season, he will need to prove himself with the Griffins. Michael Rasmussen impressed me during the July Prospect Camp, but his imposing frame was the opposite of intimidating this weekend. Perhaps he toned down his physicality for fear of injuring another player (like Tyler Bertuzzi did to Nick Jensen a few years ago). Regardless of his reason, he needed to show more tenacity. Therefore, he didn’t really stand out from the crowd. Luke Witkowski is a beast on the ice. Coming into camp with a long, bushy beard (apparently it was longer before), he was noticeable if not only for the facial hair alone. He knows why he was signed, for his gritty style and toughness, but his versatility of being able to play both forward and defense may be an important asset as the season progresses. For the purpose of this camp, he was skating with the forwards. Zach Nastasiuk was drafted way back in 2013, and he still can’t elevate from the ECHL’s Toledo Walleye, where he spent the bulk of last season. He has been lapped in the depth chart by many players, so this season will be crucial for him. Anthony Mantha is poised to have a breakout year. He knows that the team needs him to step up and be a star, and he showed some signs of greatness last season. He had a solid camp. Henrik Zetterberg, despite his age, looked great throughout the camp. He showed little signs of aging or fatigue, and his conditioning is just as good as always. The Wings need their captain to be healthy all season long, to guide these young players stepping into bigger roles on the roster. Martin Frk was surprisingly re-signed by Detroit following the Calder Cup victory (Frk himself stated he was unsure what the upcoming season would bring, and whether it would be the AHL or the KHL where he would be playing). It is still unlikely for him to see much time at the national level, but the Griffins definitely still need his booming slap shot on the power play. Dylan Sadowy is a seemingly better version of Zach Nastasiuk, but he needs to show his skills on a consistent basis. His net-front tendencies are great and his do-whatever-it-takes-to-get-the-puck-in-the-net style is always a positive. Now he needs to show that in the American League. Luke Esposito will debut for the Griffins this season after finishing his time at Harvard. He may be more skilled with the puck than Lorito, but the two appear very similar. He impressed me a lot throughout the weekend. Tyler Bertuzzi will likely earn the last roster spot on the Wings to start the season, and he earned it. He was the AHL Playoff MVP with 19 points in 19 games. Evgeny Svechnikov is next in line behind Bertuzzi, but he’ll have to wait a little while for the call-up. He has all the necessary skills. He has great puck control. He’s a strong skater. And his shootout goal in Detroit last year showed he had stick skills as well. Joe Hicketts has excelled everywhere. It’s just a matter of time before he gets his shot at the big time. He has little left to prove aside from continued success. Filip Hronek may be one of the best defensive draft picks in a long time. He has shown great offensive skills, unlike the vast majority of Detroit’s other blueline prospects. Dennis Cholowski may play this season in Grand Rapids. It will be a huge step up after an unsuccessful freshman year of college. He’s vastly underrated as a result of last season. Don’t give up on this mature and smart defenseman. Jared Coreau is no longer waiver-exempt, and Detroit runs the risk of losing the champion netminder to another team. As long as Detroit has two healthy and consistent goalies, he wlill continue to bide his time in GR. If Mrazek falters, they may just waive the young Czech goalie, a la Jaroslav Halak last season. Don’t count on Mrazek to fail just yet. Petr Mrazek was really positive throughout training camp. He seems to have a renewed determination and the competition with Jimmy Howard should push him to succeed all the more. Last season was absolutely horrendous for him, but logic says it’ll only get better from here. It’s a new season and a fresh start for Petr. It’s his job to lose now. Well, there you have it. Another training camp completed and the pre-season beginning tomorrow.